Skull Creek Reservoir is about halfway between and east of Andrew and Fields, Oregon. It holds the distinction as the (most likely… let us know if you know of a different place!) furthest south and east place in the state of Oregon where a SCUBA diver can go diving. Aside from that distinction, there is not much reason to haul SCUBA gear out to southeast Oregon south of Steens Mountain and east of the Alvord Desert. The best time of year to go dive here is in the spring just after the spring snow melt. It should be noted that this reservoir is on private land owned by Roaring Springs Ranch. Be sure to call the ranch manager and ask for permission before you go out here. You don’t want to make the long drive only to find gates closed. You don’t want to start your dive only to have a ranch hand to ask you to leave. 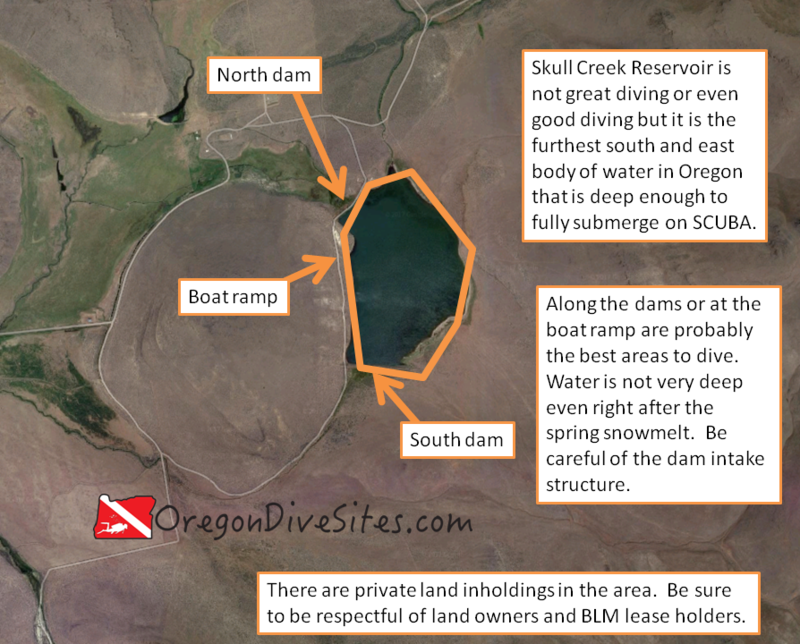 Skull Creek Reservoir holds the distinction of the furthest south and east body of water in Oregon that you can go SCUBA diving. It’s not very good diving though. The closest places with more than one or two people are Andrews and Fields. Further south on the Nevada border is Denio. Call the Roaring Springs Ranch for special directions to Skull Creek Reservoir. There are a lot of different roads out in the sagebrush and it’s easy to get lost out here. The folks at Roaring Springs Ranch will tell you where to park at Skull Creek Reservoir to be out of the way of ranch operations. The two dams on the north and south sides of Skull Creek Reservoir are probably the best places for you to try diving. There is a small boat ramp near the north dam that might make it a little easier of a dive. You can pretty much walk in anywhere along the road although it is a steep hill. When there is water in the reservoir, it is usually pretty calm. However, high winds in the area can cause some small whitecaps. This is a high altitude reservoir in the high desert. Expect very murky water with zero visibility a very real possibility. If there is still snow on the ground, water temperature won’t be much above freezing. Toward the end of the summer, expect more like 55-60F at the upper part of the (rather small) water column. Spring is when you will find water the deepest and clearest. Call the Roaring Springs Ranch well in advance before you want to go dive here. You’ll probably find about 25 feet of water. This site is at about 5000 feet. Be sure that you have altitude diver training. We rate this as an intermediate dive because of the altitude component. Also remember this is a very remote dive site. You aren’t getting any help out here if you have an accident. Unless Roaring Springs Ranch asks you to park elsewhere, you should be able to park very close to the water’s edge. You might want to kick out 100-200 feet to get deep enough water so that you can submerge. This reservoir is on private land owned by Roaring Springs Ranch. Get permission well in advance of your visit to Skull Creek Reservoir. Remember that this is an altitude dive site. The closest place you can get gear serviced or an air fill is up in Boise or out in Bend. There is no food anywhere in the area. Bring your own. There is plenty of BLM land out here where you can camp.